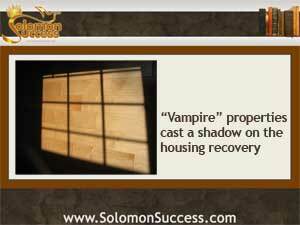 Solomon Success > Blog > Can Vampires and Zombies Stall the Housing Recovery? Can Vampires and Zombies Stall the Housing Recovery? Vampires and zombies may be hot Hollywood properties, but King Solomon advises against believing such things are real. But the housing collapse of a few years ago did create large numbers of so-called “vampire “ and “zombie” properties that are very real indeed – and this backlog of unsellable foreclosures could slow down the housing recovery. We’ve reported here previously about “zombie” properties – homes that have been simply abandoned by their owners and are now in foreclosure limbo, awaiting processing through a still-clogged foreclosure pipeline. But vampire foreclosures represent exactly the opposite problem. The vampire foreclosure, as the term is defined by RealtyTrac, which tracks trends in real estate and the housing market, refers to homes which have been foreclosed but not vacated by the owners. That’s a consequence of the massive number of foreclosures arising from the housing collapse of 2008, which created so many foreclosure actions that lenders and the courts became severely backlogged with foreclosures both legitimate and fraudulent. While some homeowners threatened with foreclosure simply walked away from their priorities – crating a zombie – others chose to stay, taking advantage of the slow foreclosure process. Some are in the process of fighting the foreclosure. But many others stopped trying to make mortgage payments or responding to notices from mortgage holders, trusting that the sluggish foreclosure process would buy them time – in some cases years of time. Some owners even rent out the property while the process grinds along, collecting income from the property while skipping the mortgage payments. And that leaves lenders stuck with properties that couldn’t be sold because the foreclosure action hadn’t been completed yet, but unable to collect mortgage payments on the properties either. The number of vampire foreclosures varies in markets around the country, with numbers particularly high in Virginia and Nebraska. But market watchers worry that while this unusable inventory may not derail the housing recovery, it could certainly slow it down. Already demand for homes to purchase is outpacing availability in some areas and pushing up the prices of homes that are up for sale. Vampire properties represent a backlog that keeps bank inventory high and adds to the number of homes in the “shadow inventory” of properties that are owned by lenders but not available for sale. As those stalled foreclosure actions are processed, homes are put on the market for sale in irregular waves that alternate large numbers of newly available homes with aa relative few. Because of the unpredictability of foreclosure timelines, it’s impossible to predict when both vampire and zombie properties will hit the markets. Some may be delayed while homeowners challenge the process, wile others, especially in states requiring a court order to finalize a foreclosure, may take months to years. When they do go up for sale, though, these properties can often be purchased at relatively low prices for fast sales. Are Zombies Haunting the Housing Industry? The Debt Ceiling Debate: Is Housing At Risk?